Ah Wednesday, nice. Warmed up this morning with Guns N’ Roses Bad Obsession followed by The Future Kings of Spain Lost and Found, The Delorentos Secret and You Can Make Sound before indulging in a fine selection from The Jimmy Cake’s MySpace. God I love Irish music and now that we’ve woken up, it’s time to point our happy ears to another of Irelands underground acts and give them the biggest break of their life or, the worst flogging they’re ever likely to get. 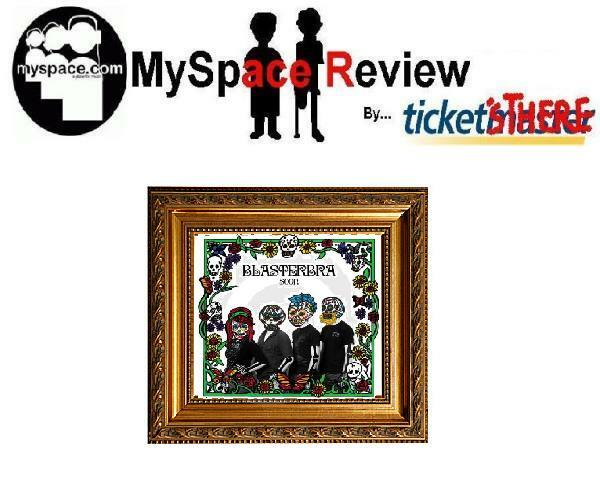 Either way, it’s a MySpace Review. Today’s choice is Blasterbra. A post-punk / alternative four piece from Co. Galway, Irelands most Beloved County…except Leitrim. They’re releasing their debut EP Soon this Friday and it’s time they went under the hammer….sorry, knife. As usual, we’ve never seen the band live or heard their EP. First up is Inactivist. It’s not a bad tune but it wouldn’t be one of Tickets There choices. It’s sparsely populated, musically dense and hard to warm up to. We waited until we’d heard everything else before writing about this song and we’re delighted to say it is the weakest link. It’s not the worst song in the world but it doesn’t have the impact it’s trying to have and just remains a little sluggish. So, let’s move on. The second track, Quiet You has abit more life to it. The vocals during the verse are a tad forced but the chorus is pretty catchy. The music’s also alot more interesting and sounds much stronger than Inactivist. It’s nothing massively original but it’s not bad either. The riff is quite slow but it’s strong enough to keep the momentum going and they don’t drag the song out, the traditional killer of good tunes. Switchblade Romance is where we find more depth to the bands writing. If some of the heavier instrumental acts in the country had lyrics, this is what it would sound like. The music full on, belting, fire breathing rock/punk and techno all fused together and the vocals are the top notch and it’s short. Great song, more please. Ah, fourth song, Basement doesn’t keep the same energy going. Its opening is much more stripped back that we’ve heard on any of the other tracks. Not long in we’re reminded there are guitars in the band and things start to fall together a little quicker. There’s a nifty, Guns N Roses-esque guitar solo towards the end and the song evolves into quite a good wee number. Finally, we get to a song that probably has more meaning these days than normal. A Break in the Weather sounds like the band achieving the down beaten sound they attempted with Inactivist. It’s bleak, it’s heavy it’s good. Imagine The Cranberries covering Sepultura and you’ve got it. Overall, not too bad (in an upbeat, positive rather than passive tone). Some very good moments and Tickets There would very much like to hear Switchblade Romance and A Break In The Weather live. Thumbs up for now and stick em on the ‘ones to watch’ list. We’d like to wish the band the best of luck with their launch on Friday (@ Freds Zepplins, Co. Cork: 20:00), hope everything goes well. Check them out at their MySpace by Clicking Here. This entry was posted on January 13, 2010 at 1:01 pm and is filed under IRISH NOISE!, Music, MySpace Review with tags Blasterbra, Blasterbra review, Blasterbra Soon ep, Blasterbra Switchblade Romance. You can follow any responses to this entry through the RSS 2.0 feed. You can leave a response, or trackback from your own site.